This is a winter game in which you will have lots of fun with this fatty character. 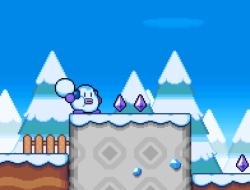 Try your best to defeat all the icy monsters by freezing them with your snowballs and then kicking them. Collect the purple crystals for points, and also for each monster you disable there will be a tasty ice cream waiting for you. Even though you are kind of fat, you can jump pretty high, but if the obstacle is too big, you can probably avoid it by entering a house and exiting on another door. If the path is blocked by icy blocks you can dash forward through them and reach the next bell. Each time you touch a bell it means you have reached a checkpoint and in the events that the monsters get you, the respawn point is at the latest one you rang. Use the arrow keys to move, jump, double jump and dash forward. Snow Tale 0.00 between 0 and 10 based on 0 votes.